Just at the entrance of Wittenbergplatz U-Bahn Station is a panel board of place names. Twelve in a list that spells the recording of one of man’s greatest inhumanities to man. These were the Nazi Concentration Camp names of which if you have read a bit of World War II history, Auschwitz is the most prominent. The Nazis used these camps for various activities as hostage, labour, prisoner-of-war, re-education, transit and extermination camps. It was in some of these extermination camps that they systemically killed off people, most especially the Jews in what is known as the Holocaust. Now, I have never visited any of these places, but in 2007, I visited Pawiak Prison in Warsaw and that experience still lives with me, for I am of the opinion that where innocent blood is shed, there is always a memorial of feeling and uneasiness that beclouds that place. However, what struck me more about the Nazi setup was their attention to detail that created a bureaucracy of such efficiency that the particularity of things they documented just took your breath away. One good example of this was the identification in the Nazi Concentration Camps where tattooed numbers, badges and armbands immediately identified the type of prisoner you were. So, you had political prisoners (red), professional criminals (green), emigrants (blue), Jehovah’s Witnesses (purple), Homosexuals and sexual offenders (pink), asocial elements (black), Roma gypsies (brown) and so on. Pink triangle along with the rainbow flag now signify LGBTI causes and diversity. The two superimposed triangles in the sign of the Star of David depicted Jews, typically yellow but could have other colours signifying Jew and another offender category. That we may never forget. They who have no history and keep no memorials are destined to repeat history, those reminded of the horrific past are quicker to embrace the greater good of humanity and human existence. More correctly, “Those who cannot remember the past are condemned to repeat it.” George Santayana or “Those who don't know history are doomed to repeat it.” Edmund Burke. We speak of history because there is a burden of truth we must carry for the present in order to secure a future of peace and happiness. The roughest I have ever slept is on a sofa for just over a week when I was graciously offered a roof having become homeless. I have been a nomad for years but have had the generosity and goodwill of others for periods of time beyond overstaying my welcome, but they have not refused me. My things are scattered between countries, cities and homes, all of which has taught me to appreciate adversity as it affects people, and yet I consider myself blessed beyond measure for I have choices and in some way, the means to make such choices. The backstory to this has been written innumerable times on this blog, I own my experiences and my story. Yet, in the capital cities of France, Germany and the United Kingdom, many have not been that fortunate. In Paris, it was whole families that I observed sleeping rough, it was humbling and quite instructive. In Berlin, I never once saw a cardboard box, but there was a spirit of humanity that I noticed. Those sleeping rough were not in store doorways but inside buildings sleeping amongst the enclosed automatic teller machines. This could mean most of the homeless had a support system to fall back on and the few without access just got this alternative. They obviously were not threatening, which might be why they were allowed in the bank branch buildings. Maybe again, Berlin businesses have a human heart that beats with compassion and empathy. However, at a very unholy hour, I saw an old man without lower limbs fast asleep in his wheelchair, his polystyrene begging cup lightly clasped in his hand, my heart melted and I put in some change with the hope that clatter of chinks did not disturb his sleep. There was no need to be thanked. It should never be on God's good earth that a man end up old and destitute with just his wheelchair for a bed. Not in Germany and not in Europe, but that is the reality and our humanity is the poorer for it, regardless of the life story of the man, the old and the young are the responsibility of the able. I have no smart answers to the big questions, but what I can affect in my little sphere of influence and impact with the little experience, advice, means and help I have got, I would strive to be a blessing to others. A bed of nails in London? 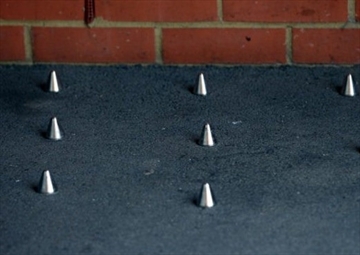 London however plumbed the depths of Dickensian malevolence when pictures appeared of anti-homeless spikes and studs being installed at entrances of prime real estate properties, we were scandalised. You would think fakirs had invaded London and were ready to entertain with one of their interesting bed-of-nails tricks, but that was not the case. Worst still was when Tesco, the supermarket giant followed suit, installing studs at their recessed storefronts, such corporate irresponsibility that tacks onto the vilest expression of capitalism is utterly, utterly beneath contempt. Tesco has lost my custom, and though after drawing public ire they have removed the said studs that they deigned to carry out the thought just shows they have no discernible humanity. I have written before, we have a serious homelessness problem in the UK that the system has not yet fully grasped, it is an issue I would continue to write about until I see changes. Many years ago, I was through a relation of mine, a guest of the Nigerian Ambassador to Germany, the experience was a complete culture shock to me. I was picked up from my hotel and as we accessed the consulate everyone; the staff and some other visitors were genuflecting with insipid subservience, it was too sickening for words. I had entered a big-man time capsule that I do not think was encouraged by the ambassador himself. I was respectful but quite dignified as someone suggested I should only speak when spoken to, not where I particularly come from or how I was brought up, I’m afraid. The ambassador was welcoming, friendly, without airs and engaging. It was clear that he craved the company of fellow countrymen who could hold a decent conversation without the excesses of the fawning we call ‘respect’, nor was I there for some quid pro quo activity or politics, so we spoke freely as if we were old friends, it was such a pleasure to meet him. In another place and setting in Berlin, one can only imagine a restaurateur encounters this problem more frequently than most, but it got a good few of us quite irked as we tried to restore some order. Running a restaurant is hard enough and having returning customers must speak for quality and service, at least in my case, both do matter and there are times where the absence of good service has informed whether I can really overlook that for the quality. They booked a table for 10 for 4:00PM but did not arrive until 90 minutes later; you may call it African time, but surely not in Germany, they arrived without as much as informing the restaurant that they’ll be running late and when they did arrive it was just 6 of them. This inadvertently is a like an Internet Denial of Service attack, because reservations mean the tables cannot be allocated to other customers and depending on the demand, the proprietor stands to lose income if those who booked the reservation arrive late or never show up. In the hotel business, at least, they have the option to charge the first night of a reservation if there is a no-show and then allocate the room to new custom for the next night, but that does not apply to restaurants. Without apology, they sat and began to throw their weight around, expecting obsequiousness and fawning like they were accustomed to in Nigeria, they began to reconfigure the a la carte menu to their particular tastes as the co-owner waitress patiently accommodated their indecisive and indulgent needs as my irritation at their demeanour began to rise. When they finished their meal, they ordered wine, as if that should come after meals, but that is beside the point, being moneyed does not necessarily mean being cultured. As the bottle was presented by another waitress they called out the co-owner waitress-manager and complained that the waitress was not smiling whilst serving them, somehow they felt they were not being fussed over enough. I had joined some gentlemen at another table as we were watching a football match and we thought amongst ourselves that that was the very wrong way to express displeasure at service if ever it was bad service. As long term customers going back years, we have never had reason to complain about service at this restaurant, but there goes. Now, I had overheard the restaurateur inform them when they arrived that he had another reservation for 12 guests from 7:00PM, they also arrived a bit late, but he had forewarned the seated party that they might have to move tables when the larger group arrives. By this time, they had more or less settled in, rearranged chairs and comfortably reclined to their wine watching the game. The restaurateur then approached them to say his booking had arrived and they would have to move, the number that was supposed to be 10 had now whittled down to 4 occupying the space for 12. At the very least in a small seating restaurant, one would have expected them to be considerate, rather they decided they were being treated shabbily and without respect, abruptly demanded the bill. The restaurateur tried hard to reason with them and placate them to no avail that we in my group got involved, offering them our seats as we readied to move to another part of the restaurant. Then that supercilious Nigerian statement was made, “Do you know who we are?” I was having none of it, who were they? I later learnt, one of the number was supposedly a major general in Nigeria, but we are in Germany. Typical Nigerian ‘Bigmanism’ an inability to moderate the delusions of grandeur and inflated sense of worth that associates with position and means in Nigeria once they have left Nigeria for other countries, especially European countries. Much as I can be a reserved Englishman, I can well be a rather obstreperous Nigerian too as I told them off one at time in Yoruba, inferring the Yoruba saying that they were like kids whose first taste of stew had it spilling all over their clothes. At which point, they realised that ‘Bigman’ card was not going to work in this restaurant, the other gentlemen with me half placated all of us as they tactfully reprimanded them. We live in Europe not cowering and fearful of people and this was not the place to be intimidated, regardless of what rank or means they had in Nigeria. They moved and settled down before one of their number came to chat to me and I simply said, whatever their grievance, we were customers too and it was important they realised they were in an international setting that just happens to be serving Nigerian cuisine. There was a need to temper their need for fawning with some appreciation of time, manner and place. He acquiesced, as we conversed in Yoruba, which meant he fully understood everything I said and it probably hit home, we cracked a few jokes, they paid up and left. We sighed with relief and much as one might have wanted to put some fault at the door of the restaurateur, we realised he must run the gauntlet of such nonsense, probably daily, some customers just need to be put in their place. For this lot, all they deserved was good service and good food, which I believed they received, they’ll have to travel back to Nigeria to be waited on like royalty. Kurfürstendamm  is the classy shopping street in the centre of Berlin that changes names to Tauentzienstrasse as it approaches the memorial Kaiser Wilheim Memorial Church  unto KaDeWe , the largest department store on mainland Europe. It has a cousin, Kurfürstenstrasse , not really parallel to it but close enough to be confusing. Starting off a few hundred metres beyond the old central railway station of Berlin Zoologischer Garten  it wends down respectably until a point where certain ladies in a manner of dress for a manner of trade ply their goods for custom. This is observed is one walks the shortest path to Pohlstrasse where a Nigerian-Italian couple runs a restaurant serving Nigerian fare, the man being the chef at Ebe-Ano . There are a few things I conservatively consider have their times of the day. For instance, I would not look kindly on alcohol consumption before the afternoon, but ladies on heels on the street even in a pseudo-red light district before dusk is quite disconcerting. Not only is it that, there is a sense of almost effrontery and daring aggression but could belie desperation when you as a man are found on the rough end of salacious ogling for the pleasure of an illicit liaison. One can only wonder what happens when the light of the sun makes way for the dim light of the moon. Not a street to walk after a certain hour, I would suppose. However, whatever the circumstances put the ladies out there, for situational adversity through will to the coercion borne of heinous human trafficking, there is some sadness can only be felt as people meet different human needs in the darkest recesses of primal desire. I hope the church at the tail-end of the street offers succour to all who ply that street of strange. As I returned to my hotel, I walked up Bülowstraße , the far end of the street that started off this blog, she flagged down a car, it stopped, she negotiated and he nodded, she got in and they drove off. For as long as I can remember, probably the earliest was in 1985, the inaugural FIFA U-16 World Championship where out of nowhere Nigeria came tops to take the cup in China. A very unlike prospect that came second in the group stages and then we took out Hungary, Guinea and West Germany to unexpectedly claim the championship. This love for Nigerian soccer prowess was rewarded when the 1996 Summer Olympics in Atlanta we took the gold beating Argentina to it – Karma, I say. When the World Cup came to France in 1998, I was going to avail myself of the opportunity and after beating Spain 3 – 2 in Nantes, I was on the coach to Parc des Princes in Paris to was the tension-filled Nigeria v Bulgaria game which we took 1 – 0, only to lose 3 – 1 to Paraguay in Toulouse. I cannot say I once saw the ball in the stadium on the 19th of June 1998 but at the end of the match, I had no voice, I had shouted myself hoarse. Much as I would have loved to watch another game, it was an experience of a lifetime ruined by the Nigerian arrangers who for profit treated us too shabbily for words. Our run in 1998 ended with a 4 – 1 trashing by Denmark in the Srade de France, I don’t think we’ve gotten too far since. By 2002, it was Korea/Japan, I was living in the Netherlands, but they were not in it, so I split my allegiances between Nigeria and England, Nigeria did not make it out of the group stage coming last, their best performance being a goalless draw with England. Argentina also came third in that group but England lost to Brazil in the Quarter finals. The World Cup returned to Europe in 2006, Nigeria did not make to Germany and the Netherlands was out to Portugal in the round of 16 with England losing to Portugal in the Quarter finals that I was left with vacillating opinions in two blogs, both written whilst on holiday in France, the first lamenting our misfortune and the second celebrating the run of the French to the final. 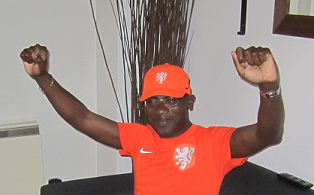 I donned the Orange strip of the Netherlands when the World Cup came to Africa in 2010, on work days, it was an orange scarf and tie, whilst on other days I had the shirt and face baseball cap. After 10 years of living in the Netherlands and all I had experienced, there was no doubt where I had my football allegiances. As we danced to Waka Waka (This Time for Africa), none of my thoughts were with Nigeria that came last in their group or England that expired in the round of 16. I was in Gran Canaria, Spain for holidays when the Quarter finals started and on the 11th of July, 2010, I found a bar with Dutch supporters and we watched as the game descended in almost farce and in the process Spain won the World Cup. Dejected and forlorn, I walked back to my hotel unable to acknowledge the celebratory noise of the Spaniards, it was a horrible feeling. But Hey! For Brazil 2014, Nigeria of parental descent, England of birth and the Netherlands of experiences are out there doing their stuff. I had already told my friends that the Netherlands would have my support because I believed they would get far and not dash my expectations as Nigeria and England are wont to do. The Netherlands has already taken the “S” out of Spain with a 5 – 1 bruising defeat of Spain, even I did not expect that pummelling from Holland. England has suffered a defeat from Italy and Nigeria might yet perform against Iran, Bosnia & Herzegovina and Argentina but I am not holding my breath whilst I wish them luck. For World Cup 2014 it is Hup! Hup! Holland, all the way. That is my team. Once is experience and informative with hopefully enough learnt to decide whether it is worth another try or not. Many things I have tried or done once and never tried again because I have in the common saying been once bitten and twice shy. This does not mean I do not have a sense of adventure, it just means I am reticent about being divorced from the mountain of experiential trophies I have acquired in my lifetime. First impressions of people that has stopped me from reengagement, bad customer service, unnecessary rudeness, selfish attitudes completely inconsiderate of others, places that have no welcoming atmosphere, food that has once made me ill, the list is almost inexhaustible. One must however not be curmudgeonly, circumstance and situation may have made the first time bad experience inadvertent and unfortunate. If I am tempted to relive beyond the once, it is hoped enough is there to change one's mind after the last time failing which, it is never again. Then, in a lifetime there are still many things we hope to experience at least once, love, beauty, fun, happiness, awesomeness, wonder and excitement in events, places, people and ideas and long may that zest for life live, for once, for many times and forever. Knowledge is an eye-opener, for with it comes revelation heretofore unbeknownst to the seeker. I am always reading up on material that pertains to my health especially trying to understand the circumstances that presented my vulnerability to disease. It was with some shock and ruefulness that I read up on two episodes that reduced my resistance to infection and compounded manifest symptoms. In meeting certain needs, I had been carefree, in that I was not careful and thereby, I was quite careless. One cannot deny that certain habits breed an attitude of being carefree, that in itself is not being careful about how the desires are met and when that issues with enough carelessness, care and caution are thrown to the winds. Going back, I have wondered if I ever had specific information or it was too general to appreciate what the consequences were. I cannot remember any time when I really knew what I recently learnt. I could be sad, angry or even depressed, but since I can neither undo or change what is past, I might as well taken full responsibility for my carefree deeds and move on. In essence, check, check it, check in, check out everything that needs checking and have it in check before no checks can save you from not having been careful where carefree situations present careless options. It suddenly occurred to me how people are so poorly educated in the use of language or in some cases they make no appreciable effort to improve vocabulary, expression and breath of use beyond the perfunctory. Sadly, there are too many cases where a lot can said with the finery of prose that conveys a lot more than the animal grunt of a blurted out expletive. However, people cannot be bothered to exercise themselves through reading good material and elevating their speech to a level of sophisticated comportment. For example, I asked if the cakes on sale at the end of the day were going for a song, now, crudely, one could have asked if the cakes were cheaper, but believe the choice of words make for a better class of person. You wonder whether Basic English idioms need to be taught in school too. Also in a rather high-brow shop on Jermyn Street a few weeks ago, I could not see myself shelling out so much for so little, so for the convenience of the shopkeeper and the myself, I offered that I would not be making such a big hole in my pocket. We both understood I would not be buying what they had on sale and I went on my way. In the same vein, I believe I do speak Yoruba quite well and even though I left Northern Nigeria in 1977, I can still get by with rudimentary Hausa. I find that Yoruba is quite rich in expression, not just through the choice of words, but in the use of idioms, adages and proverbs. Quite recently I have taken to sharing proverbs on Twitter, many quite laden with meaning that only the aficionados would nod in acknowledgement. What bothers me is how quite a few of us whose mother tongue is English have not only mastered the use of Yoruba, but are sometimes seen as probably better speakers of Yoruba. The slight perfectionist in me would mostly write with all the essential diacritical marks so as to avoid any misunderstanding, and though one can deduce the context of what is being said without the marks, nothing speaks better than being proper. Yet, everyday users of the language usually cannot complete a sentence without the use of colloquialisms or borrowed words for all sorts of reasons, a classic case of letting the side down. Indeed, we should all simplify communication, but at the same time, a lot more is learnt and shared by working a language in all its aesthetic quality – this only comes with a love for learning. You are not saying it right, work at it and get better, what is worth saying at all, is worth saying right and well. I have no problems with people who need to keep in contact with family, friend, colleague, partner or whatever form of relationship defines the need to communicate. The ubiquity of the mobile phone has offered opportunities once not possible a few decades ago. Though, then, you probably made conversation in private, out of earshot in a room, a phone booth or an office. I however still have the mindset of needing to take mobile phone calls undistracted. If away from home, I would find a place to sit down to chat. On the very rare situations where I take calls without sitting down, I would most likely be taking directions on how to get to some place. What I find so irksome is people who do not realise how distracting taking a call on the street can be. It is almost impossible to given equal attention to a telephone conversation and your surroundings. Studies have shown that concentration is impaired by the distraction of a mobile phone call which can be dangerous for essential reaction when driving but also dangerous for being unaware of ones surroundings. Yet people do fool themselves into thinking they are in control when clearly from observation they are not. They are slower to react, slower walking, usually don’t walk in a straight line, more expectant of others not to bump into them as they walk along being carried by the flow of the crowd. There are times I have scolded some to put away their phones as the try to mount stairs, get on escalators or board vehicles. Those who send SMS messages are worse as they tap or scribble away on their devices ensconced in that world and completely oblivious of others. They are a public menace beyond mere annoyance consumed with a yearning that lacks restraint as the moment lost in having consideration of others is an eternity lost forever. Indeed some things need urgent attention but not at the expense of being controlled, ordered and particularly considerate. That is what I look for in people without having to demand they recognise where they are.